Five years doesn’t sound like a long time, but when Carrboro-based non-profit TABLE celebrates its fifth birthday this April, it will be clear that its community impact has been no small feat. On Saturday, April 20, TABLE will hold a birthday party of sorts for the organization at Carrboro Farmers’ Market with food trucks, three local bands, craft vendors and kid’s activities. TABLE also welcomed a new executive director, Ashley Chatham, in March. Chatham, a UNC-CH alumna, first began volunteering with TABLE as a shift leader when she was a sophomore at UNC. Ashton Chatham, the new Executive Director at TABLE organizes the upcoming volunteer shifts for the TABLE backpack program. (Staff photo by Morgan Johnson). TABLE’s birthday event will run from 4:30 p.m. until 7:30 p.m. and will include a silent auction for adults to raise money for many of TABLE’s initiatives throughout the year. According to UNC student Cameron Coughlin, a freshman and a TABLE intern, funds can contribute to anything from nonperishable items for children’s backpacks to other food items for local students. TABLE, located at 205 W. Weaver St., focuses on raising awareness of local childhood hunger and feeding many of the community’s hungry children. “Almost 30 percent of kids in Chapel Hill and Carrboro have free school meals but go hungry on the weekends,” said MacVane. MacVane said that she will now serve as a member of TABLE’s Board of Directors. She wants to continue helping with community outreach, she said. “I am still really involved with the organization, I’m just wearing a different hat,” she said. The 30 percent of students mentioned by MacVane are enrolled in the National School Lunch Program, which means their family income is only slightly above the national poverty level. The children are all elementary school children who live in the Chapel Hill-Carrboro school district, and according to Chatham, TABLE is adamant about serving every child in need, regardless of religious affiliation, gender, cultural/ethnic origin, ability or race. “By partnering with various after-school programs, TABLE identifies children at risk of hunger and in need of food,” Chatham said. TABLE raises funds for its programs by hosting food drives/collection events and teaming up with local workplaces, neighborhoods and churches. In addition to churches, TABLE also works closely with college students from UNC-CH through the Campus Y and local people in the community to feed children in need. 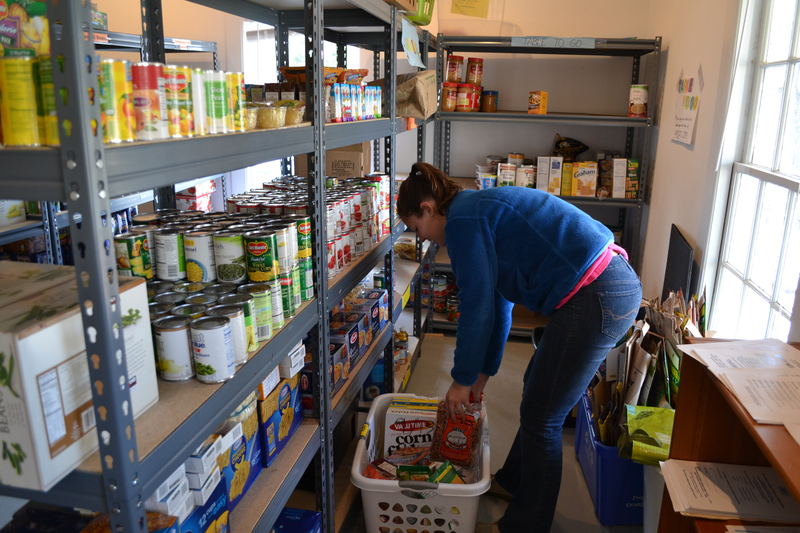 Cameron Coughlin sorts the groceries that will be organized into the backpacks given to Chapel Hill and Carrboro Kids. (Staff photo by Morgan Johnson). Coughlin said he estimates TABLE serves over 170 children in Chapel Hill and Carrboro. Coughlin is a Bonner Scholar who has been with TABLE since coming to UNC last fall and plans on working with the group all four years that he attends the university. “TABLE for Two,” which introduces children to healthy eating habits and food preparation, has 10 volunteers participate every Monday in an on-site project where they teach students how to make healthy snacks, something Coughlin has been involved with on several occasions. “The most enjoyable and rewarding experiences of TABLE include the interactions that I have with the kids who receive [our] food,” she said. Most recently, TABLE went to Hargraves Community Center, where they helped teach students to make yogurt and fruit parfaits. “Teaching students how to make a healthy snack can translate to them teaching their parents about healthy foods,” Coughlin said. TABLE is also responsible for making meal “backpacks,” which are bags filled with healthy snacks, nonperishable food items and recipe cards. Healthy items put into the backpacks include an apple, tangerine, celery or any other fruit or vegetable, Coughlin said. The nonperishable items can include anything from granola to macaroni and cheese, and the last item, a recipe card, will tell the student how to use the nonperishable food item to make a meal, she said. “The reason why our backpack program is so important is that it is the only way some students have a meal during the weekend while not at school,” Chatham said. Volunteers from UNC and local churches create the backpacks during the week. After backpack making, on Thursday afternoon, from 2 to 4:30 p.m., two groups of volunteers, one at Holy Trinity Lutheran Church in Chapel Hill and the other at Pritchard Park in Carrboro, hand out food to the students as they hop off the bus. MacVane said her biggest focus while spearheading TABLE’s efforts was combatting the array of problems that often plague children in need, including issues ranging from health problems like childhood obesity to academic problems. “I mean, I know I’m useless if I’m hungry. These children really need to be able to do well in school. And they need to break the cycle of poverty and I think education is a really good way to do that. And hungry kids have trouble learning,” she said. Chatham, who shares many of the goals that MacVane envisioned for the program is looking forward to her new role at TABLE. “We were really happy to promote Ashton Chatham to the executive director,” MacVane said, noting that she’s looking forward to seeing what direction Chatham takes with the program. Throughout its fifth year and for many years down the road, TABLE hopes to continue making an impactful contribution to the Chapel Hill-Carrboro region. 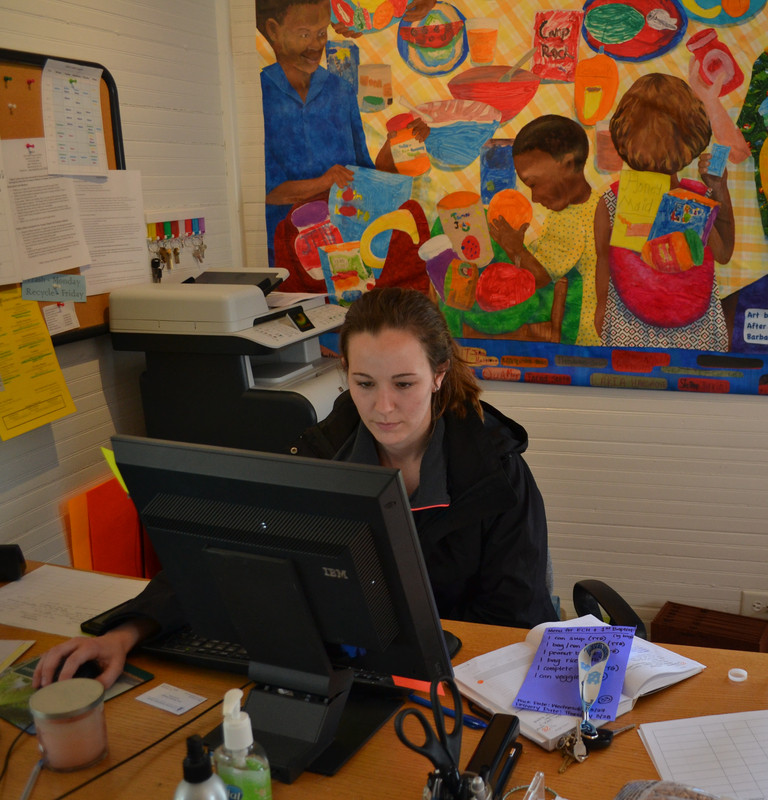 Morgan is a Carrboro Commons staff writer.